We will continue to work on the material from Podcast 1 – Introduction to Charge and Podcast 2 – Conductors, Insulators, and Charging on Monday and will conduct some informal experiments to investigate methods of charging. Next we will reinforce these concepts by doing assignment 1 in class. Our next topic will be electric force. Please take notes on Podcast 3 – Electric Force when assigned. We will follow this by doing assignment 2 together in class. If there is time, we will start to work on electric fields, so please take notes on Podcast 4 – Electric Fields part 1 and Podcast 5 – Electric Fields part 2 if announced. At long last, after many snow (and…ahem…”senior skip”) days, we will complete our examination of our day star in unit 2 by doing an activity linking solar radiation to climate. The unit 2 test will be on Tuesday. To help you prepare, please do the Unit 2 – Homework Questions, which is due before the test. It is also time to begin our second outdoor lab, the Unit 2 – Outdoor Lab. This takes many days to complete, so it will be due in three weeks on Monday, April 21. (Do not delay starting, because you need to take multiple measurements spaced days apart.) After the test we will examine the Big Bang and the big news announcement this week from researchers at the South Pole. (See “Cool Science of the Week,” below.) This will prepare us for Thursday’s guest Skype speaker. Physics students are welcome to join this Skype conference during 2nd period on Tuesday with permission from your teachers. Welcome to the last week of the quarter! Please be sure to check PowerSchool and turn in any missing assignments asap. Due to the snow day this past week, we are following last Wednesday’s OGT schedule on Monday. Juniors and seniors have late arrival, and only periods 4/5, 6/7, 8/9, 1, 2, and 3 will meet. As we will not meet on Monday, we will not be able to test this week. Homework 3 will be due on Wednesday, and homework 4 will be due on Thursday. Your electrostatics lab report is due Friday (with upload to TurnItIn.com by 3:00) and will be the last grade for third quarter. Expect the unit 10 test right after break, likely on Tuesday, April 1. Also note: Your Cedar Point ticket money and permission slips are now due on Tuesday by 3:00pm. Because class was canceled on the due date for our Unit 1 – Outdoor Lab, and since we haven’t had class since, the lab is now due on Monday. This week we will continue to work through unit 2 on the apparent motion of the sun. It is unlikely that we will be able to do the unit test this week. Also note that we will have an assembly during our class period on Friday. Do you love spicy food? 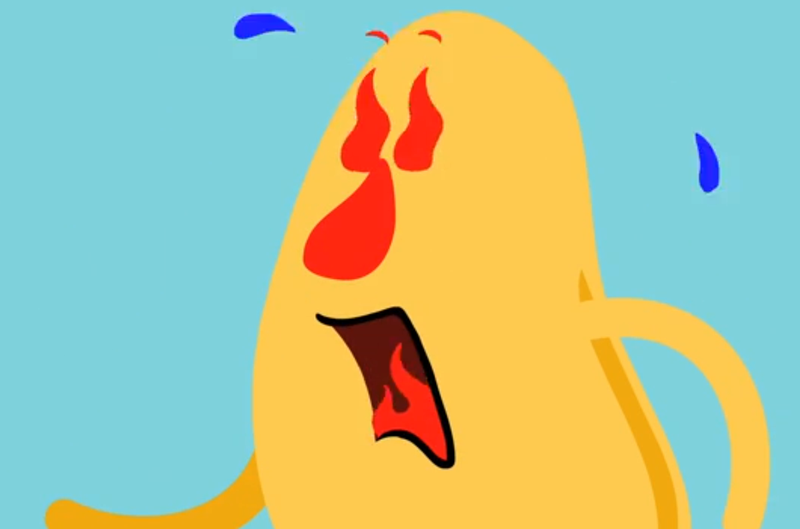 Check out this video explaining the science of spiciness! Astronomy class only meets Monday and Wednesday. Physics 3rd period only meets Monday and Wednesday. Note that our lab period (4/5) is the first period of the school day, and our 3rd period will meet later in the day. Physics 6th period meets every day as usual. Note that our lab period on Tuesday and Thursday will be your first period of the school day. We will conduct our electrostatics lab on Tuesday and will hopefully do homework 3 for Friday. Expect the unit 10 test the following week, the week of March 17. Please remember: YOUR CEDAR POINT MONEY AND PERMISSION SLIPS ARE DUE ON FRIDAY. We will (hopefully) finish our unit on circular motion and gravity, although the test won’t be until the following week, the week of March 17. For Monday please take notes on Podcast 5 – Gravity and Podcast 6 – Center of Mass, Gravity, and Planetary Orbits. We will discuss those on Monday and do assignment 2. What we don’t finish in class will be due as homework for Wednesday if you are in 3rd period. For 6th period, we will finish the assignment in class and then spend the rest of the week doing an enrichment engineering project. Please remember: YOUR CEDAR POINT MONEY AND PERMISSION SLIPS ARE DUE ON FRIDAY. We will continue to examine the daily and annual appearance of the sun’s motion in our sky and will (if time) relate it to climate. There will be a unit test the following week, the week of March 17. NOTE: We have had plenty of clear nights, so your Unit 1 – Outdoor Lab is still due. However, since we’re not meeting on Tuesday, I’m extending the due date to Wednesday, March 12. This past week the movie Gravity won an Oscar for visual effects. Have you ever wondered how CGI works? Check out this article and video that shows you how the Gravity team made the movie magic happen!